Team Rector: Rev David Baldwin, The Rectory, Clay Lane, Beaminster 862150 (day off Friday). 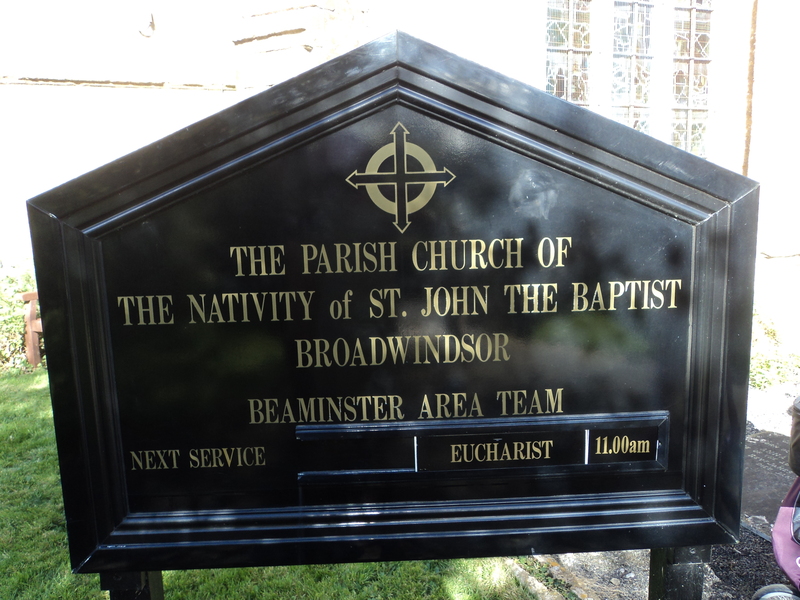 The church of St John the Baptist, Broadwindsor, is on a commanding position in the centre of the village. It is probable there has been a Christian building on this site since Anglo-Saxon times, but the structural evidence in the present building takes us back as far as the 11th century when it was probably a simple cruciform shape. Towards the middle of the 12th c the south aisle was added. The pillars can be dated by their scalloped capitals and are considered Norman in style and, except for one, remain in their original positions. Around the year 1230 the north aisle was added and the pillars, which date from that period, are the 1st and 3rd, counting from the western end of church, and are Early English in style. During the 13th/14th centuries the tower was built at the west end and much of that original stonework survives and the chancel was extended eastwards doubling its original length. In the 15th century a porch was added to the south door which is itself 14th century. For the next 300 years restoration work concentrated on interior furnishings, a double decker gallery being added in the late 17th or early 18th century. The upper gallery being reserved for the choir that consisted of any villagers who possessed musical instruments and could play them. In 1818 the ancient rood screen was removed. In the middle of the 19c the fabric of the church was very dilapidated and the Revd. Soloman Caesar Malan set in motion a major restoration and rebuilding programme. The nave and aisles were extended eastwards thus shortening the chancel and a small vestry was added.